WASHINGTON, D.C. -- The percentage of U.S. adults without health insurance grew in the second quarter of 2017 to 11.7%, up from 11.3% in the first quarter. 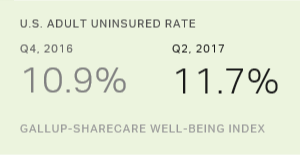 The uninsured rate, measured by Gallup and Sharecare since 2008, had reached a record low of 10.9% in the third and fourth quarters of 2016. The results for the second quarter of 2017 are based on 45,087 interviews with U.S. adults aged 18 and older from April 1 to June 30, conducted as part of the Gallup-Sharecare Well-Being Index. Gallup and Sharecare have asked a random sample of at least 500 U.S. adults each day whether they have health insurance since January 2008. Despite upticks in the uninsured rate in each of the first two quarters of 2017, the percentage of U.S. adults without health insurance is still 6.3 percentage points lower than it was at its peak in the third quarter of 2013. The uninsured rate reached 18.0% that quarter, just before the health insurance exchanges opened in October 2013. Beginning in 2014, the Affordable Care Act's individual mandate required Americans to obtain coverage or pay a tax penalty. Several marketplace factors could be contributing to the uptick in the uninsured rate since the second half of 2016. Rising insurance premiums could be causing some Americans to forgo insurance, especially those who fail to qualify for federal subsidies. Furthermore, some insurance companies are leaving the ACA marketplace, and the lack of competition could be driving up the cost of plans for consumers. Uncertainty surrounding the healthcare law also may be driving the increase. President Donald Trump's executive order permitting agencies to waive or delay provisions that "impose a fiscal burden" on individuals, as well as the prospect of a new healthcare law may be causing consumers to question whether the penalty for not having insurance will be enforced. Since the last quarter of 2016, the increase in the percentage of uninsured, though only 0.8 points overall, has been concentrated among younger adults. The uninsured rate has risen 1.9 points among those aged 18-25 and 1.5 points for those aged 26-34 since the end of 2016. These young adults are, perhaps, particularly responsive to rising premiums in the individual healthcare markets. For some young adults, the tax penalty for not carrying health coverage may be more financially appealing than paying costly premiums on coverage they need less frequently than older Americans. From a long-term perspective, young adults aged 18-34 have shown some of the most substantial decreases in uninsured rates since the federal requirement to obtain health insurance coverage took effect, falling about seven points. The decline in uninsured among this group is likely due to an ACA provision that allows young adults to remain on their parents' health insurance until age 26. Meanwhile, only 2.3% of adults age 65 and older report being uninsured in the second quarter of 2017 -- nearly unchanged since the last quarter of 2013. Young adults represent a critical demographic in a robust healthcare market, since their premiums help offset the higher costs of older Americans who typically use more medical services. The uninsured rate has also fallen substantially among blacks, Hispanics and lower-income Americans -- three groups with some of the highest uninsured rates prior to implementation of the individual mandate to carry insurance. The uninsured rate among Hispanics remains the highest of any major racial or ethnic group (28.4%); however, it has fallen 10.3 points since the last quarter of 2013 when it was 38.7%. Similarly, 13.3% of blacks report being uninsured in the second quarter of 2017, down 7.6 points from 20.9% in the last quarter of 2013. The uninsured rate among lower-income adults has dropped more than nine points since the individual mandate went into effect. By comparison, the uninsured rate for middle-income and high-income adults has fallen about two points since the last quarter of 2013. Gallup and Sharecare also track how Americans are getting their health insurance. Most Americans aged 65 and older receive health coverage through Medicare, and thus changes to the health insurance system did not affect where they receive insurance. As such, Gallup and Sharecare assess changes in insurance sources among adults aged 18 to 64. Since the last quarter of 2016, the number of adults under age 65 who report that they or a family member fully paid for their own plan -- many of whom purchased coverage on ACA exchanges -- has fallen 0.7 points, the largest change across all sources of healthcare coverage. Since the individual mandate took effect, the largest change in how insured Americans are obtaining their coverage has been in those fully paying for their own plans. The proportion of those who are insured who are in this group has grown by three points since the last quarter of 2013, from 17.6% to 20.6%, likely reflecting purchases of health coverage on the marketplace insurance exchanges introduced by the ACA. The second-largest increase is in Medicaid-based coverage, with the percentage getting their insurance through this program -- mainly covering lower-income and disabled Americans -- rising more than two points to 9.2%. This likely stems from the ACA's Medicaid expansion provision that offered additional federal funding to states that expanded Medicaid eligibility. Gallup and Sharecare began asking Americans about the source of their health insurance using the current question wording in August 2013, in anticipation of shifts in how people would receive their health insurance after the healthcare exchanges opened. Gallup asks Americans, "Is your primary health insurance coverage through a current or former employer, a union, Medicare, Medicaid, military or veteran's coverage, or a plan fully paid for by you or a family member?" Gallup also asks whether they have secondary health insurance coverage and, if so, what type of coverage it is. The results reported here are a combined estimate of primary and secondary insurance types. House Republicans have passed a bill to replace the Affordable Care Act, and Senate Republicans have drafted their own version of the bill, though it faces resistance from some moderate and conservative Republicans. Both the House and Senate proposals walk back key components of the ACA, including the individual mandate, expanded Medicaid funding and essential health benefits that all insurance plans must currently cover. The nonpartisan Congressional Budget Office estimated that 22 to 23 million Americans could lose health coverage under the House and Senate proposals. Although the increase in the uninsured rate from the end of 2016 to Gallup's most recent update is small on a percentage basis (0.8 points), it is statistically significant given the very large sample sizes involved, and translates into nearly 2 million Americans who, apparently, have already dropped out of the insured ranks. 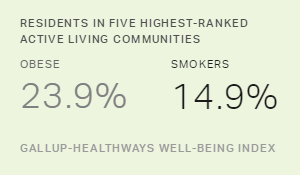 Results are based on telephone interviews conducted April 1-June 30, 2017, as part of the Gallup-Sharecare Well-Being Index survey, with a random sample of 45,087 adults, aged 18 and older, living in all 50 U.S. states and the District of Columbia. For results based on the total sample of national adults, the margin of sampling error is ±1 percentage point at the 95% confidence level. All reported margins of sampling error include computed design effects for weighting. Healthcare Surges as Top Problem in U.S.
Mentions of healthcare as the most important problem facing the U.S. soared in May, and now tie for first with mentions of government dissatisfaction. Americans continue to rate the honesty and ethical standards of healthcare professionals highly. Members of Congress rank at the bottom of the list. Inefficiency in the U.S. healthcare system is a chief reason why costs are spiraling nationwide and why healthcare is consuming an ever-greater share of the gross domestic product (GDP).